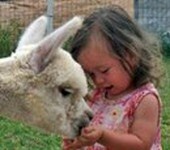 We started researching Alpacas in 2005 after seeing the "I Love Alpacas" commercial on TV. We visited a few farms and it was love at first sight. Our original intention for the 24 acres we had purchased in New Mexico was to open a motorcycle campground and touring company, as we were avid riders and loved touring the country on our bikes. But after our introduction to Alpacas, we knew we had to do this. We worked hard all summer of 2009 to get ready for our first animals. We have 24 acres of Pinon and Juniper pines that will eventually be fenced off into between 10 - 18 pastures. Our beautiful 1722 sq. ft. barn is definitely the hub of our operation and was strategically placed to insure a great layout, conducive to excellent herd management. Our focus is on the fiber, as we feel it is hard to argue with the 5000 year old business plan that the originators of the alpaca industry have lived by. However, as the industry changes we are ready to change with it. In fact, in some regards, we find our selves ahead of the curve. Check out my "Alpaca News" page by clicking on the Alpaca News tab above. 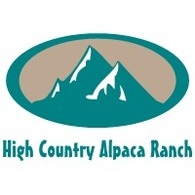 I collect news items that I find on the web relating to the alpaca industry and lifestyle and display them here for you to enjoy. In addition to posting them on my Facebook page, I now post them in this central location for you. Feel free to pass on news items you find that I may not have put up yet.